The peaceful beach of Pine Cay and Water Cay. 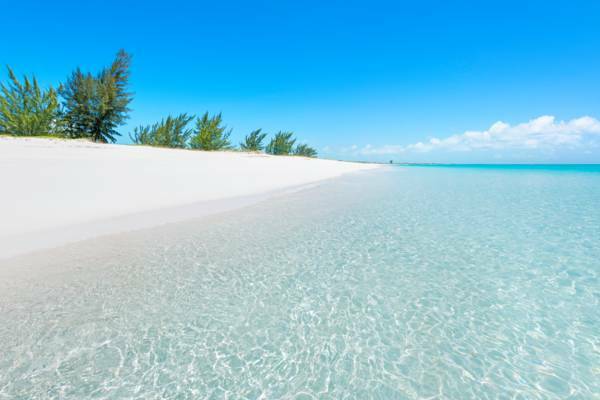 The spectacular beach and ocean at Pine Cay, Turks and Caicos. 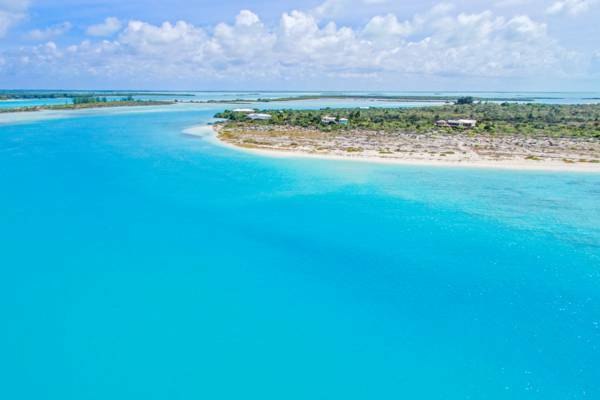 Situated in the string of cays between Providenciales and North Caicos, Pine Cay is privately-owned and has low density residential development. The main feature of the cay is its spectacular two mile long north coast beach, which definitely ranks as one of the top beaches in the country. Pine Cay offers a very quiet and laid-back atmosphere. Today the island is home to the secluded Meridian Club resort and about forty private residences and vacation villas. 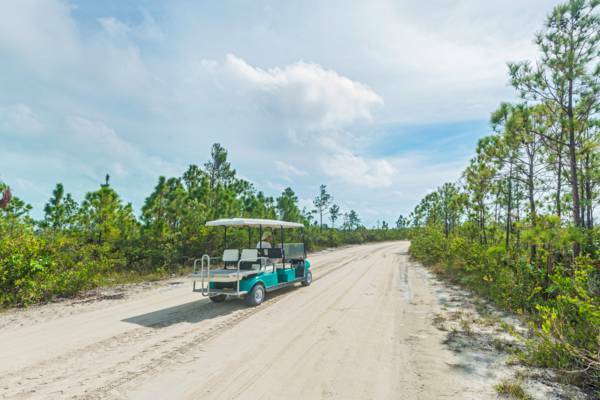 The island has a no car policy, so electric golf carts and bicycles are the main means of transport. 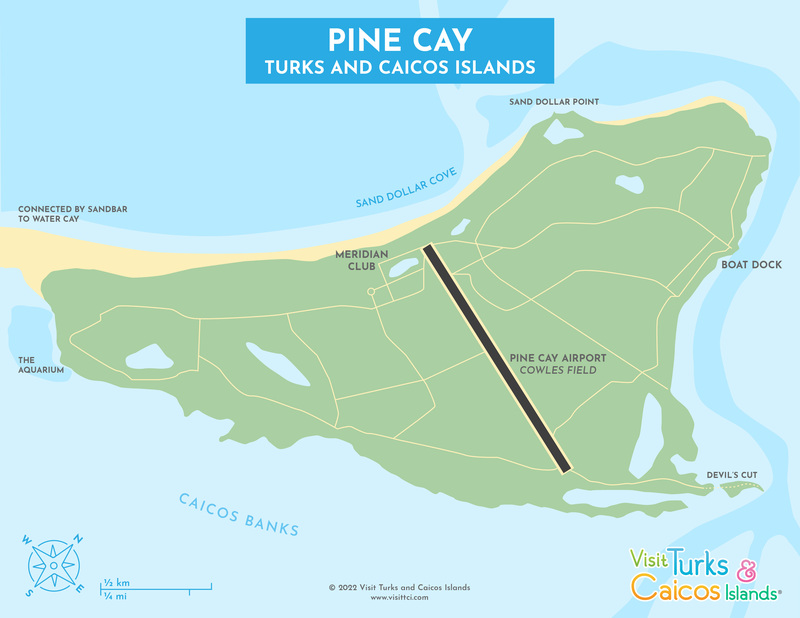 Pine Cay is named after the small forest of endemic Caicos Pines (Pinus caribaea var. bahamensis, a subspecies of the Caribbean Pine) that surrounds the interior fresh water ponds. The dock at Pine Cay. Pine Cay is home to an often-overlooked and tranquil all-inclusive resort destination: the Meridian Club. This private resort offers the atmosphere of the old Caribbean – laid-back exclusivity. There’s a selection of beachfront rooms, cottages, suites and private villas to choose from. The Meridian Club isn’t extensive, yet it offers the perfect collection of amenities for those looking for a quiet tropical vacation. Onsite is the Meridian Club Bistro restaurant, which serves a cuisine of international classics. There’s also the resort’s Sand Dollar Spa, offering massages, facials, scrubs and wraps. In addition to the spectacular beach fronting the resort, the complimentary guest use of kayaks, stand up paddle boards, Hobie cat sailboats, and bicycles is offered, and scuba diving, snorkelling, fishing and boat cruises can be easily arranged from the nearby island of Providenciales. There are also tennis facilities, hiking paths, and an entire island to explore. 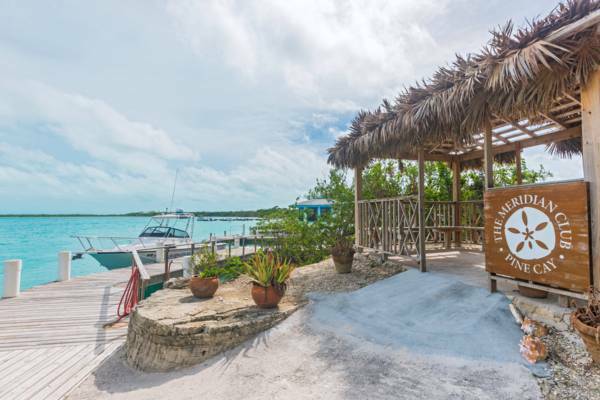 The Meridian Club also manages vacation rentals for some of the villas and home on Pine Cay for owners who are away. Aerial view of Pine Cay, Turks and Caicos. Due to the secluded nature and small size of the Meridian Club and Pine Cay, the island can be a great location for weddings and corporate retreats. For the best reservations and the best rates, we advise that you book directly with the resort. If you’re able to find lower posted prices on third-party sites, local accommodation are typically willing to match or do better. As is the case accommodations and activities throughout the country, room rates will typically be lowest during the end of summer “ low season” months. A forest of Pinus caribaea var. bahamensis, the Turks and Caicos subspecies of the Caribbean Pine. The terrain of Pine Cay is quite flat, with the low density salt-resistant vegetation common to the coastal areas of the county. The island supports a small population of the endangered Caicos Pine (not to be confused with the common and invasive Casuarina that thrives on much of the coastline), but the populations of this rare tree has been declining. Total landmass is about 800-acres. Pine Cay is actually connected at this time to Water Cay by a 450 foot wide patch of sand and light vegetation, and Water Cay is likewise connected to Little Water Cay (Iguana Island), so it’s possible to walk along the beach for the entire five miles to Little Water Cay. Historically, these channels have been opened and closed by occasional hurricane events, such as the 1866 Great Nassau Hurricane. Like its Parrot Cay neighbour, Pine Cay has several brackish ponds, an unusual sight in the dry Turks and Caicos. These ponds are a haven for a diverse range of bird life. The group of small islands between Providenciales and North Caicos were reputed to be the sanctuary of pirates in previous centuries and Pine Cay was very likely a base due to the semi-fresh ponds in an otherwise parched archipelago. The main highway on Pine Cay! 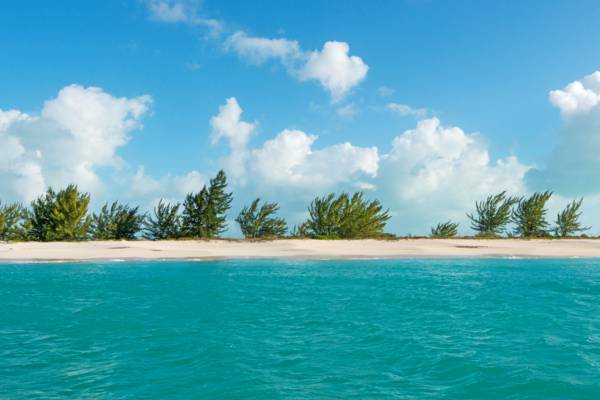 The usual way to get to Pine Cay is by a 15 minute boat ride from Providenciales. There are no regular public passenger ferries, yet the Meridian Club operates a guest ferry, and boat tour excursions from Providenciales often visit the island’s north coast beach. Pine Cay also features a 2500 foot paved airstrip for private planes and charters flights. There are no fuel facilities or immigration or customs personnel onsite, so international flights must land at either the Providenciales International Airport (PLS) or the Grand Turk JAGS McCartney International Airport (GDT) when entering the Turks and Caicos. There are two FBOs on Providenciales that offer fuel and flight services. Casuarina trees on the northern coast of Pine Cay. 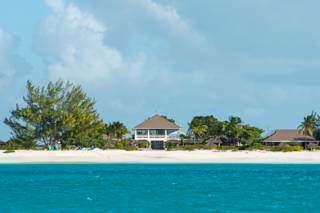 Pine Cay is one of the oldest boutique and private island developments in the Turks and Caicos, the island once having been owned by Count Ferdinand Czernin of Austria-Hungary, who saw the potential of the isolated cay as a luxury tourism destination. After his death, his wife Countess Helen Czernin continued with the concept, with the result of the Meridian Club, marina, infrastructure and airstrip. Existing home and undeveloped real estate is available, both beachfront and inland. The Meridian Club oversees the Pine Cay Homeowners Association, which offers management, maintenance, and vacation rentals services for privately-held residences. 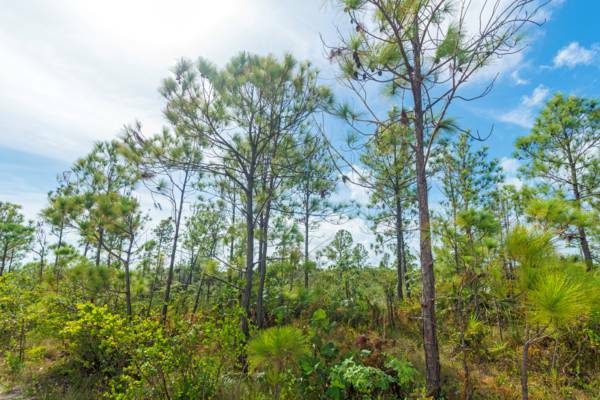 There isn’t an extensive selection of properties available on Pine Cay, yet a couple sites may typically be on the market at any given time. 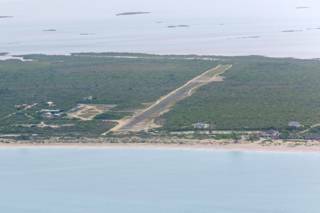 This small private 2800 foot (850 meter) asphalt airstrip is located on the small island of Pine Cay.